I even went on a walk and got some coffee at a local bakery. boutique I work at, Grey Dog. Anyways, I hope everyone is having a lovely weekend! a stunning vintage outfit, love the bowler hat too. glad you're feeling better! Gorgeous outfit- love the hat! You're beautiful. NO WAY!!!!!!!! you work at grey dog????!!?!?!? before this starts sounding weird, i live in siloam springs :) i've only seen pics of it and it looks so cute! one of these days i'm gonna get over there and check it out. and wasn't the weather incredible today??? and tomorrow will be even better. and i do love your blog, just so you know. I love your hat, it really tops your outfit! 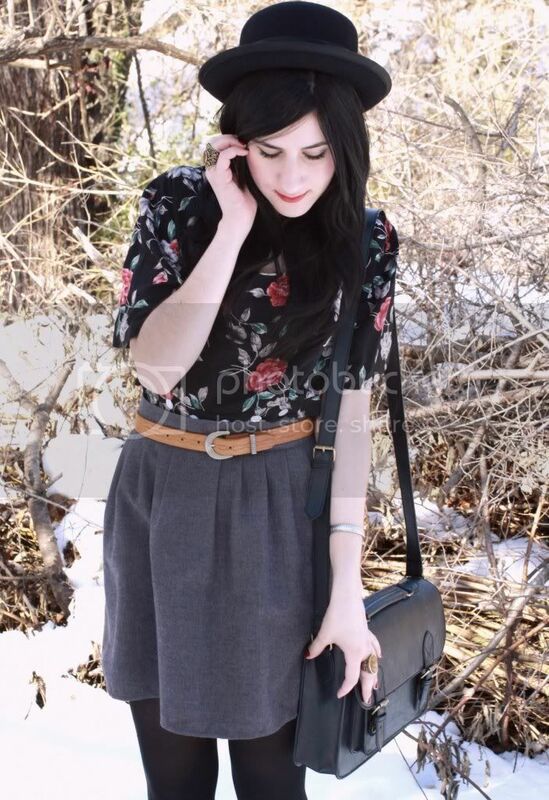 I am so jealous of all you vintage items :P I so need more florals in my life! Very pretty blouse! Glad you're feeling a bit better. Glad you're feeling better! Your hat is awesome, too! Great outfit! I really love the belt. Yay for warmer weather! and the illustrations in the previous post are great! Glad you feel better! Peppermint hot chocolate always makes me zap out of a headache or cold. 1. Im so glad you are feeling better! You may be the prettiest 'sick' person I have ever seen! 2. Can I have your hair? I love that almost everything you wear is vintage or thrifted, it is always so perfectly put together and so creative! I adore your bowler hat, it sits so perfectly on top of your head and is such a perfect addition to your feminine outfit! Glad to hear you're feeling better! Your outfit is so lovely, and I especially adore the blouse! looovely. your editing is so impressive. also, i just read that mommy comment again haha and it made me laugh. I honestly really love a lot of the clothes and accessories you own and wish I had that kind of a wardrobe. Guess it'll take some time before I can build it up lol... seriously I love your style! I love vintage! Just discovered your blog through mod cloth......I LOVE IT. your outfit is quite beautiful. it's like spring has already come. the blossom of your blouse is looking perfect with that skirt! glad you are feeling better now. have a lovely weekend too! Oh, so lovely once again! I love your hat, aswell as the simple satchel bag. I've been looking all over for one of those. Get better soon! you're looking very beautiful in these! You look still more and more wonderful:) Great hat! The top is just adorable! And I love those tiny details on the belt :) Pretty outfit! Stop by my blog sometime! you work at a vintage boutique?! lucky girl! And I can't wait for spring to come! I love the floral top (and good work altering it from a dress). love your outfit by the way.. especially the hat, it fits your style just perfectly. I'm not feeling good too! That cold is killing me! hope you're waaaaay fine! I love this outfit... yes! once again, but girl you're always that perfect! Love your outfit! You look stunning! glad you're feeling better, and your outfit is beautiful as always! a lot of kisses from poland! Oh super cute look, hope you had a great weekend! You look like a modern Snow-White, I love it! L.O.V.E. the shot of you looking down babe! So gorg! Keep in touch cutie! Hello beautiful, these radiant, as always!, your looks with vintage air I love, so always follow you, because I know that does not disappoint, a loving kiss. Aaaawwww, your outfit so so unbelievable cute! I adore your hat! And thanks for stopping by and leaving your lovely commnt! That means sooo much to me! I want to steal your style! WOww whaat a cute outfit, you look so angelic! I am now following you on twitter. 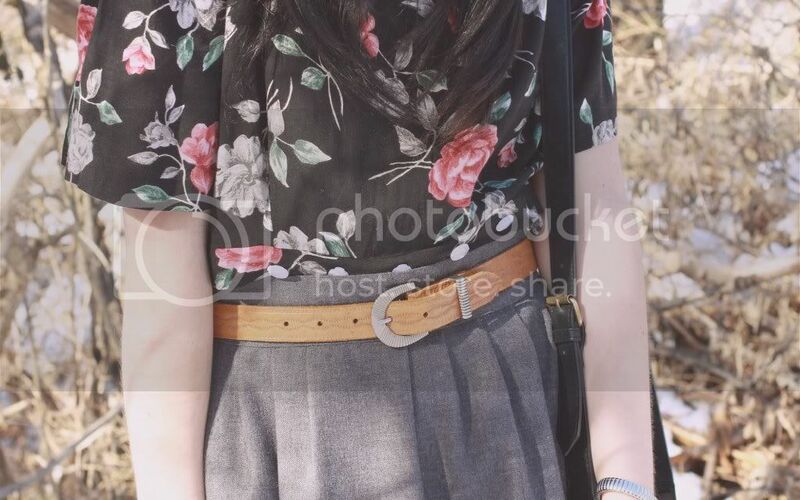 the skirt and belt are so good with this floral top! lovely outfit - looks a bit chilly though !!! You looks so lovely in your bowler hat. Glad you're feeling better. love the blog! and the post!! One of your outfit has been chosen as third outfit of the week in my blog. As always great outfit girl, love you stachel. That dress-turned-into-a-blouse is amazing! I wish I could drown myself in your closet LOL I always love everything you wear! Hope you will get better soon! i love all your looks so much! you look great here! i hope you feell better soon . 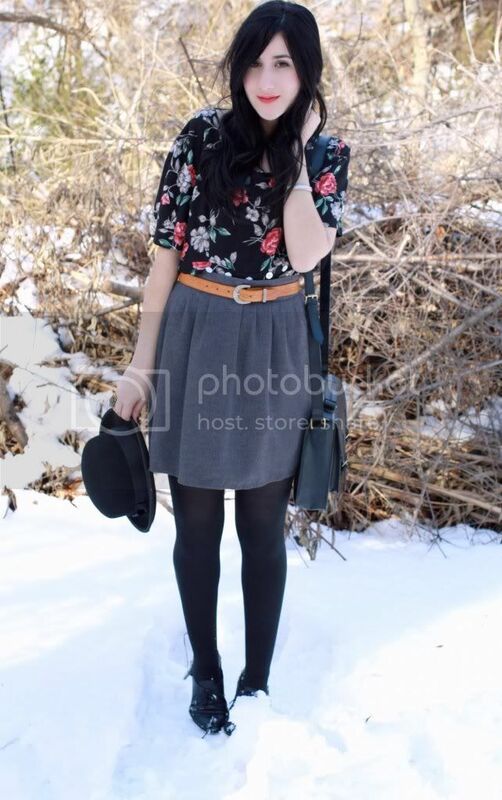 nice outfit and nice blog! What a great idea to turn the dress into a cute floral blouse! I'll keep that in mind for the next time I find a lovely vintage maxi dress. I love the top of your blog!! How can I do something similar with the letters?? Putting flowers on it?? i'm glad you're well and that the weather is warm! it's getting a bit warmer here, too, yay! you have such fair skin. very pretty! Love youre blouse , is really amazing !